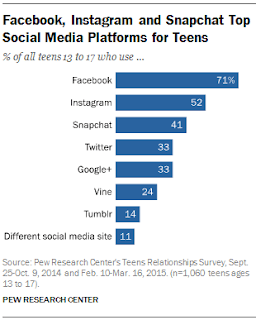 "This week Pew Research Center released Teens, Social Media & Technology Overview 2015, a report that should have relevance to all of us who work with young people. Unlike Pew's previous surveys, which involved representative samples of teens interview by phone, this one was conducted online. These data are useful for us in deciding how we reach the young people we love and in understanding how they themselves manage their lives online." Read Joyce Valenza's complete post for a good summary of this document.